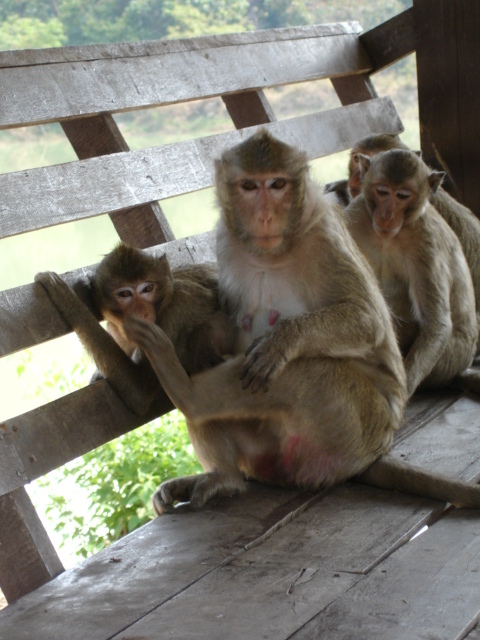 The Phana Macaque Project came about largely because of a few blogs I wrote earlier this year on Life in Phana (www.phanathailife.typepad.com). I had been in and out of the monkey forest, Don Chao Poo, on a daily basis and had got to know many of the long-tailed macaques well. Not just got to know them, but I had also begun to be concerned about their welfare. 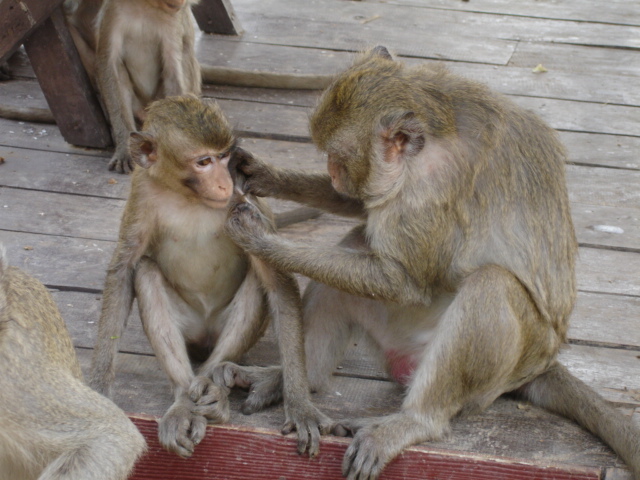 This blog is concerned solely with the monkey forest in Phana, so it seems sensible to include those three posts on this site. The first was about feeding the monkeys and the pleasure it gives me to be with them. One of the things that causes lots of people to panic is when a monkey starts to pull at your clothing, or to climb up it. But as you see here, there is no need to panic. But at times when they are particularly hungry perhaps, there will be a scramble to get food from visitors. But this does not always happen. 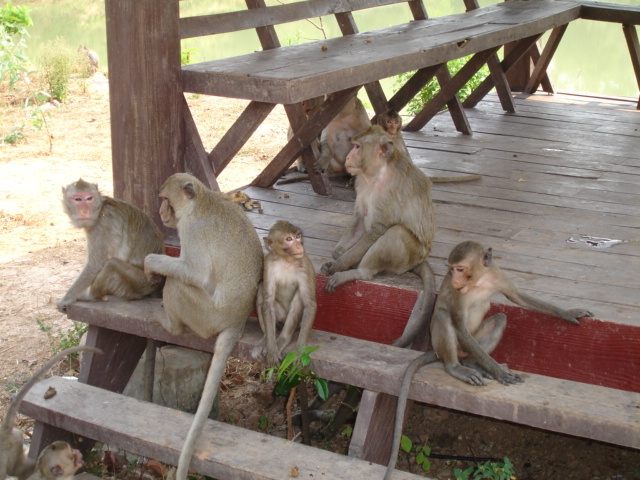 If you have plenty of food to give, and especially if you can scatter it on the ground, it is much less likely to cause aggressive behaviour amongst the monkeys. And sudden, mock-aggressive movements by you, such as swinging the bag towards the invasive monkey, will make them keep their distance. But you don’t have to feed the monkeys to enjoy being with them. Early in the morning, round about mid-day and in the middle of the afternoon seem to be times when the monkeys are relaxed, not particularly searching for food, and you can walk and stand and even sit among them and enjoy a peaceful time with them. You can watch them at different times playing, grooming, mating, or just sitting quietly. Here are some pictures I took on a Sunday afternoon at a sala next to the pond in the forest. The monkeys were happy to share the place with me, but there was no doubt in their mind that the tetsaban had provided the place primarily for their leisure. 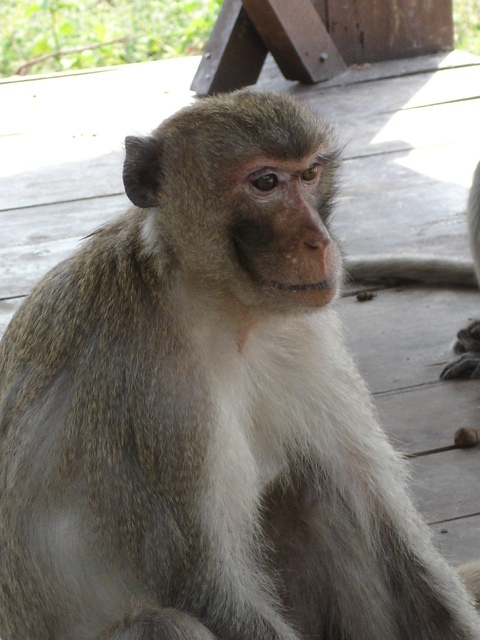 This entry was posted in Long-tailed Macaques, Macaca Fascicularis, Macaques, Monkeys, Tetsaban Phana and tagged aggressive monkey behaviour, Don Chao Poo, Long-tailed Macaques, monkey forest, Monkeys, Tetsaban Phana, Thai monkeys, Thai primates. Bookmark the permalink.